In March 1766, Parliament repealed its Stamp Act for North America but passed the Declaratory Act, meant to establish that it had the power to pass laws governing those colonies—including, implicitly, new tax laws. One of the few voices against the Declaratory Act was Charles Pratt, first Baron Camden, soon to be Lord Chancellor of England. He argued, as he’d done when the Stamp Act was proposed, that since the colonists didn’t have any representatives in Parliament, by British tradition Parliament shouldn’t have the power to tax them. Very few Members of Parliament agreed. Camden’s political ally William Pitt actually wrote the Declaratory Act. 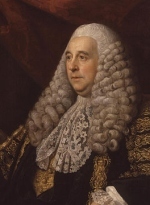 Lord Mansfield, the Chief Justice, said Camden was mistaken. Only four other Lords voted against the bill. My position is this—I repeat it—I will maintain it to my last hour,—taxation and representation are inseparable;—this position is founded on the laws of nature; it is more, it is itself an eternal law of nature; for whatever is a man’s own, is absolutely his own; no man hath a right to take it from him without his consent, either expressed by himself or representative; whoever attempts to do it, attempts an injury; whoever does it, commits a robbery; he throws down and destroys the distinction between liberty and slavery. Taxation and representation are coeval with and essential to this constitution. . . . In short, my lords, from the whole of our history, from the earliest period, you will find that taxation and representation were always united; so true are the words of that consummate reasoner and politician Mr. [John] Locke. And that page, published in February 1768, is the earliest appearance of the phrase “[No] Taxation without Representation” that I’ve found. It debuted in big letters at the top of a page of a widely circulated magazine. I suspect that pithy, rhyming summary of the argument below stuck in many readers’ minds and became the slogan for the American cause. Thus, I posit that the person who coined the deathless phrase “taxation without representation” wasn’t James Otis, Jr., or the Rev. John Joachim Zubly or even Lord Camden. It was John Almon or an anonymous editor or printer in his shop, looking for a way to headline a couple of columns of text in a limited number of characters. Another missing link on the chain are some pamphlets, presumably published in Britain, that Camden mentioned in his speech: “seventy years ago, my lord, a pamphlet was published, recommending the levying a parliamentary tax on one of the colonies; this pamphlet was answered by two others, then much read; these totally deny the power of taxing the colonies; and why? because the colonies had no representatives in parliament to give consent”. I have always been under the impression that the phrase "taxation without representation" originated from a sermon (later published) delivered by the Rev Jonathan Mayhew in Boston in 1750. Now long forgotten, Rev Mayhew was a very influential liberal pastor of the Old West Church in Boston who died in 1766 and whose sermons and pamphlets about the nature of government and the responsibiliites of it and its citizens greatly influenced James Otis and Samuel Adams. Otis, in particular, knew Mayhew very well, corresponded with him, and could have easily quoted him. I discussed the Mayhew claim back in 2009. I couldn't find any citation to a specific sermon, much less a published one, and I couldn't find claims for Mayhew's precedence more than ten years old. I looked through the texts of Mayhew sermons I could find, and they said nothing about taxation and representation. If anyone can offer a citation, I'll take another look.